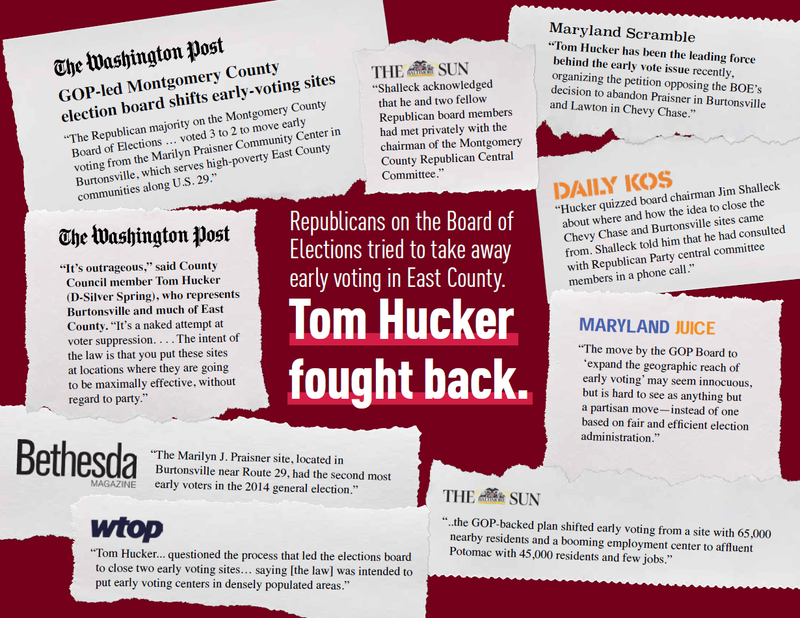 When the county’s GOP-controlled Board of Elections tried to eliminate early voting sites in Burtonsville and Chevy Chase, Council Member Tom Hucker was one of the leaders in getting the decision overturned. 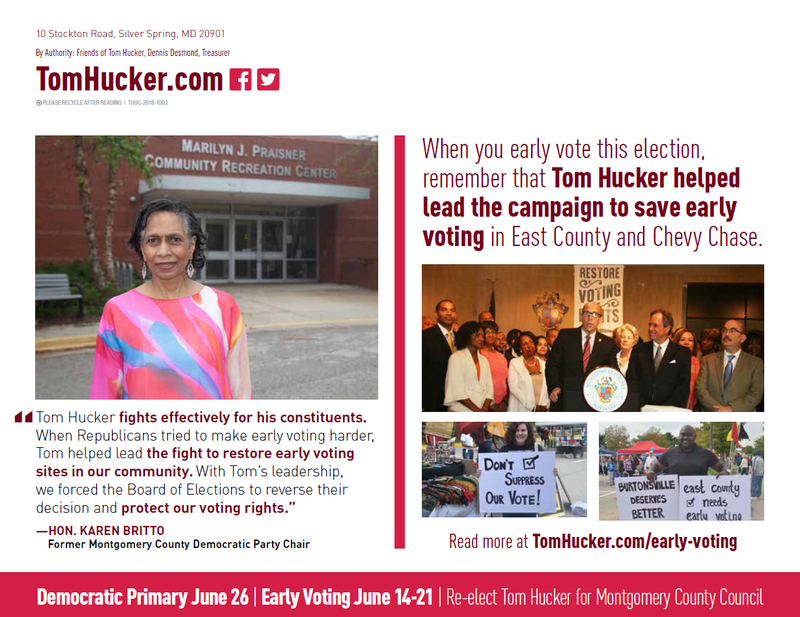 Hucker is reminding his District 5 constituents of that achievement with the mailer below. 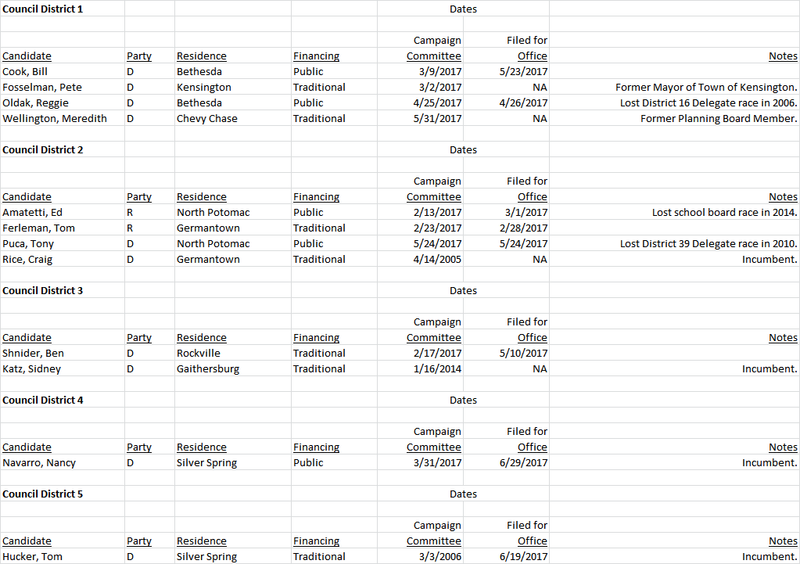 A few interesting things popped up in candidate filings today. Krish Vignarajah has still not filed for Governor. Baltimore County Executive Kevin Kamenetz has filed, but his announced running mate, former Montgomery County Council Member Valerie Ervin, is not listed on his filing. 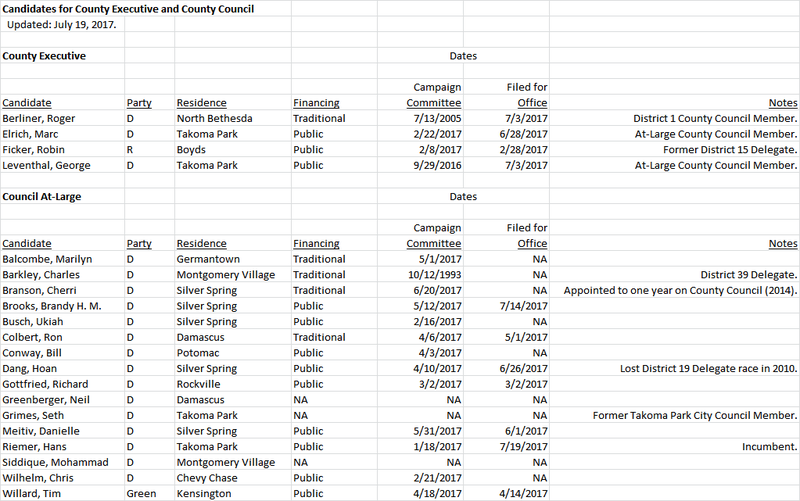 Grace Rivera-Oven, who was the Political Director of David Trone’s campaign for Congress, filed to run for Council At-Large on February 26. She has started a traditional campaign finance account. Jarrett Smith, who is a current member of the Takoma Park City Council, filed to run for Council At-Large on February 23. Smith was reelected to the City Council in November and will not have to leave his seat to campaign for county office. Smith has started a traditional financing account. Kenge Malikidogo-Fludd has filed for County Council District 5. Bethesda Magazine previously reported that Kevin Harris is running against incumbent Tom Hucker. Malikidogo-Fludd is using public financing, as is Harris, while Hucker has not yet opened a public financing account. However, Malikidogo-Fludd’s listed address is in Germantown, which is not in District 5. Jaye Espy, who was running for Delegate in District 15, withdrew from the race on February 21. Michelle Carhart of Rockville filed for District 18 Senate on February 22. Delegate Jeff Waldstreicher and Dana Beyer, who has run for Senate and House unsuccessfully in the past, are also running. Carhart’s website is inactive at this writing. Filing closes at 9 PM tomorrow night. There may be more news in store by then! Note: an earlier version of this post reported that Jarrett Smith had not yet established a campaign account. We apologize for the error. Reliable source tells me that MCEA is getting ready to revoke its endorsement of Chris Barclay for Montgomery County Council District 5 in the wake of the school board expenses scandal and endorse someone else unknown to me. Wise decision to maintain credibility in the wake of this disqualifying scandal.